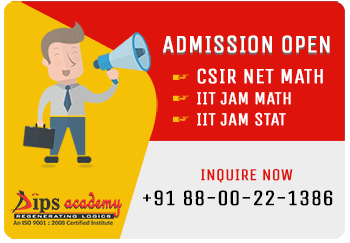 Today era is highly influenced by Information Technology and thus most crucial exams conducted online and since these exams are necessary for the scholars student as they achieve success by clearing them only For example CSIR, Gate and JAM. Most number of students of DIPS Academy got selected in these exams because our students experience the real exams temperament from the online test platform which is used by DIPS Academy. Our Online test platform is best in India and more or less same used by exams conducting body. All the students of DIPS Academy are provided by the unique User ID and Password. Students not only able to give the test by using these ID’s but also get a comprehensive analysis. Students from pan India can get the benefits of our online test. Our test Package is differentiated according to the needs of students and they can choose them as per their requirement which is not only helping them in preparation of exams but also they can check their all India Ranking. Our Online Test are merged with the classroom test so that students can compete themselves from our regular students and most sincere aspirants of the exams. Questions are available on each and every minute concept. Practicing of test paper helps you in understanding the whole concept. Papers are designed as the real pattern.